When Robin was ten years old, her father bought her a thoroughbred colt whom she named Fox. She groomed him every day and sometimes even slept in the barn with him. The two were inseparable. When Fox was old enough, she trained him, and he became a show horse. Even though he loved to ride the trails around their farm, and graze in the field, when he saw the trailer pull into the corral, he knew it was show day, and he almost trotted into it. When Robin and Fox rode together, the trust between them was so strong it was almost as if they were a single unit. They could read each other’s movements with little if any, cues. They won show after show, prize after prize. As Robin grew, she became one of those kids that brought home stray animals. They ranged from dogs and kittens to mice. Many of them were hurt or sick. So her father used one of the empty horse stalls and put a sign on it – Robin’s Animal Hospital. When she was old enough, her father suggested she apply for a job as a veterinary assistant. He explained what it was and she was so excited, she applied to all the vet clinics in the area. A small, single-vet office called her and offered her a part-time position in the afternoons and on weekends. In that job, she walked dogs, bandaged legs and ears, and learned how to repair a broken wing in a finch. She was also responsible for less dynamic tasks like cleaning exam rooms and ordering supplies. You’ve probably surmised that Robin went on to become a veterinary technician. Then she moved into the position of veterinary technologist and eventually applied for admission to and was accepted by a veterinarian program and earned her DVM license. If you, like Robin, have a love of animals and want to contribute to their wellness, read on about becoming a veterinary technician. It is one of the fastest ways to enter the field of veterinary medicine. A Veterinary Technician is an entry-level position which is a step up from veterinary assistant. Vet Techs work in a variety of veterinary settings including animal shelters, veterinary clinics and offices, and sometimes even animal daycare. In addition to general animal patient care, Vet Techs perform laboratory procedures and medical imaging. They may also administer and monitor anesthesia and assist with animal surgeries. Veterinary technicians are not the same as veterinary technologists, a job which requires additional education. Veterinary technicians are critical members of veterinary care teams that ensure animal patients receive the best possible care. 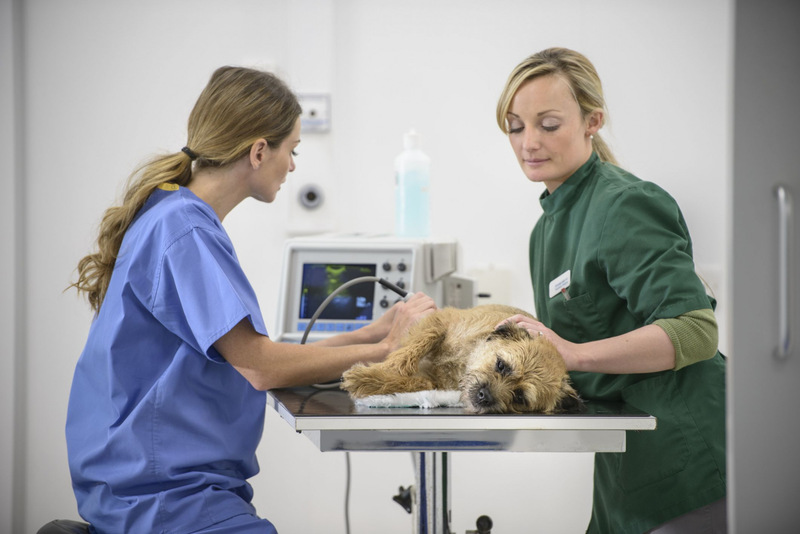 Vet techs perform different duties depending upon where they work. In smaller veterinary practices, you will perform administrative tasks, like filing and staff scheduling as well as direct animal patient care. In larger practices these duties may be split between two people. Regardless, since you’re interacting with animals, the work is varied. The following list is a snapshot of typical vet tech responsibilities. Administering medications, shots, or treatments. Watching animals for changes in behavior. Most vet techs work with small animals like dogs and cats, but also mice and birds. Large animal vet clinics will care for horses, cattle, pigs and sheep. Nurses in hospitals and doctor’s offices care for human patients. As a veterinary technician, you are in a similar role. You are a nurse of sorts, but for for animals. And, like nurses, you must be able to communicate effectively and compassionately to animal owners. More importantly, you’ll learn ways to communicate with animals who can’t express their needs, where they hurt, or how they are feeling. When you adopt a career working with animals, it can be very rewarding. But since animals aren’t always passive and accepting of your help, and don’t understand what kind of treatment, or exam they are undergoing, it can be stressful and frustrating. If you have trouble maintaining a high levels of patience, you may want to consider a different healthcare career. Veterinary technicians should be. . . Becoming a veterinary technician starts with having a high school diploma. Your next step is to earn an associate degree in veterinary technology which takes about two years. If you want to advance in the field, you can take the next step and earn a four-year bachelor’s degree to become a veterinary technologist. If you already have your associate degree, it will only take another two years, and you can continue working as a technician while you complete your education. A program in veterinary technology includes general education courses like English, math and psychology. But concentration courses in animal care are at the heart of any animal training program. You will frequently take courses similar to those on the following list. Anatomy & Physiology for Animals. In addition to the theory courses, you will be required to earn least 500 hours in a variety of veterinary settings. This gives you plenty of hands-on practice working with animals and animal care teams. Even if you find a veterinary technology program that is offered on line, you will serve externship hours and be supervised by a qualified veterinarian. Ensure any school or training program you attend is accredited by the American Veterinary Medical Association (AVMA). Graduation from an AVMA-accredited institution is a prerequisite to sit for the Veterinary Technician National Exam (VTNE). Most states and employers require that veterinary technicians pass the Veterinary Technician National Examination (VTNE) administered by the American Association of Veterinary State Boards. Certification means you are ready to assume the duties of an entry-level animal healthcare professional. While you are in school, begin making arrangements to take the test four to six months before graduation. The exam is only offered three times and year and you want to take it as soon as possible after graduation so your knowledge of veterinary technology is fresh. Review courses and practice exams are available. Check the American Association of Veterinary State Boards (AAVSB) for further information. Any role in veterinary medicine enables you to work with animals. But just like in general healthcare for people, there are some specializations you may be drawn to more than others. You can choose to specialize, or be more of an animal generalist. As a vet tech you will work at labs, clinics, private offices and shelters. People who become veterinary technologists do so because they love working with animals. It is a passion that drives everything they do. It would be remiss to say that you will make tons of money as a vet tech because it is not a lucrative position. So when considering or negotiating for compensation, review potential benefits packages. They could offset a lower hourly wage. According to the Bureau of Labor Statistics (BLS), as of May 2017 the median pay for the combined roles of veterinary technicians and technologists is $33,400 per year. The average hourly wage was $16.06 per hour. Employment opportunities for veterinary technicians and technologist is expected to increase 20%, which is much faster than average. American Pet Products Association (APPA) states that consumer demand for enhanced pet care continues to grow. Pet spending overall has more than doubled to over $38 billion due to the special bond between owners and pets as best friends and companions. It is estimated that $9.4 billion will be spent for veterinary care alone. Baby boomers are filling empty nests with pets and are contributing to the growth within the industry. Another factor is young couples waiting until later in life to have children and, meanwhile, spoiling the family pet. These families have more disposable income and are happy to shower their pets with special toys, comforts and even daycare and dog walkers. Veterinary technicians as well as technologists are considered entry-level trainees who work under the direct supervision of a veterinarian. As individuals gain experience, they take on more responsibility and carry out more assignments, but only under general veterinary supervision. If you love animals and want to work with them everyday, entering the world of veterinary medicine may be perfect for you. Becoming a Veterinary Technician is one of the quickest way you can earn money while doing what you love.